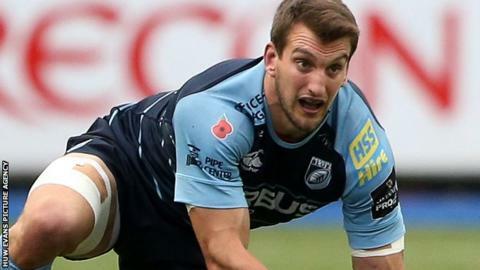 Wales captain Sam Warburton could return for Cardiff Blues against Harlequins on Sunday. The Welsh region will make a late decision on the fitness of Warburton, who has not played since injuring an ankle against Ospreys in November. If he does not make the match at The Stoop, he is likely to return against Calvisano on 22 January. Wales face Ireland in their opening match of the 2015 Six Nations on Sunday, 7 February. However, Wales head coach Warren Gatland will be cheered by the news that Gareth Anscombe, injured in the World Cup match against South Africa in October, could make his return against 'Quins. "Both Sam and Gareth are making good progress," said Blues head coach Danny Wilson. "It will probably be the latter stages of this week that we will make the decision on both players and Sam is more likely to play the Calvisano game. "Both players are making the right strides and I think in the next two weeks we will see both of them on the field." The future of Wales wing Alex Cuthbert is still undecided, but Wilson says he is keen to keep the winger at the club. The 25-year-old's contract runs out at the end of the current 2015-16 season. "He has impressed a lot with his performances and his attitude towards his rugby and he has been great to work with so far and I think his form has taken an increase," added Wilson. "Those conversations are ongoing and when we are in a position to make a comment we will."